So the wait is over. 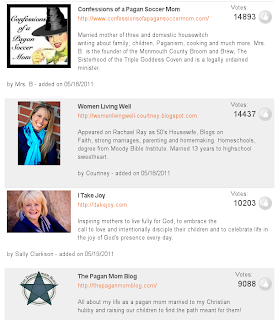 The Top 25 Blogs of Faith By Moms has come to an end over at Circle of Moms. 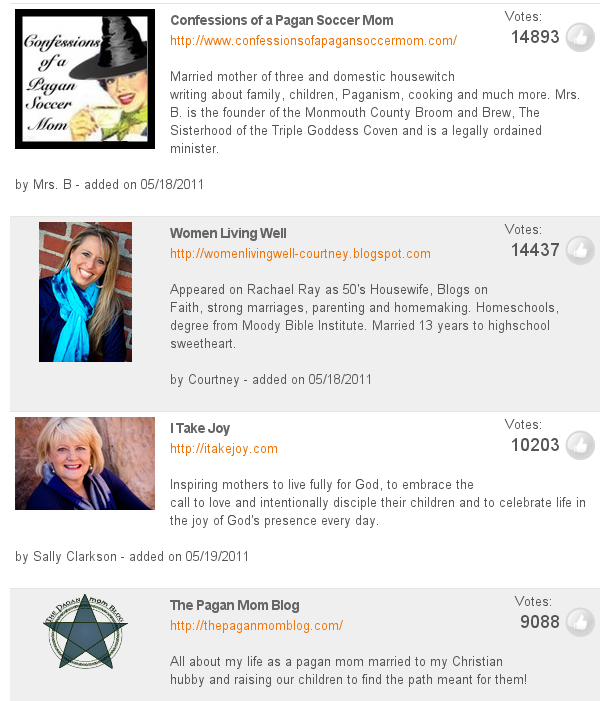 In the top four blogs, the Pagan Community was represented by two great blogs! I'm extremely excited and proud of our support of this contest. All the pagan blogs came up and out of the Top 25, Pagans represented 12 of those blogs. Amazing. Well done! Here is a list of the remaining Pagan Moms. A great showing ladies. Thank you so much for putting yourselves out there and representing Pagans is a positive and lovely way. Thank you! And thank you for mentioning all of the pagan mommies. I am getting a bit frustrated with phrases like "A pagan mom won the contest". In fact 12 pagan moms won and I feel like some people are getting shortchanged on being in the Top 25. Mrs B deserves that top spot, don't get me wrong! BUT, let's not make it sound like only one blog won a top 25 contest, ya know? Takes a lot to put yourself out there and represent your faith when you're up again and entire group of people who are slamming you in their own blogs. I have nothing but respect for all the bloggers who participated in that contest. Well done! !